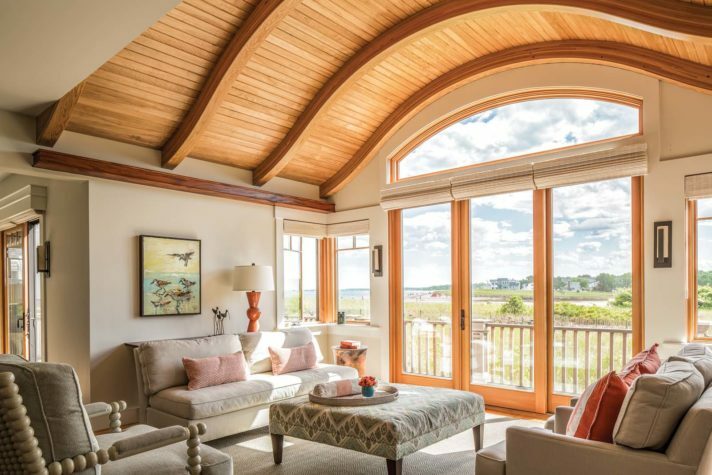 In the living area of an Ocean Park home designed by John Morris Architects and built by Rideout and Turner, an arched ceiling paneled in red birch serves as a piece of the home’s “jewelry,” as Morris calls it. 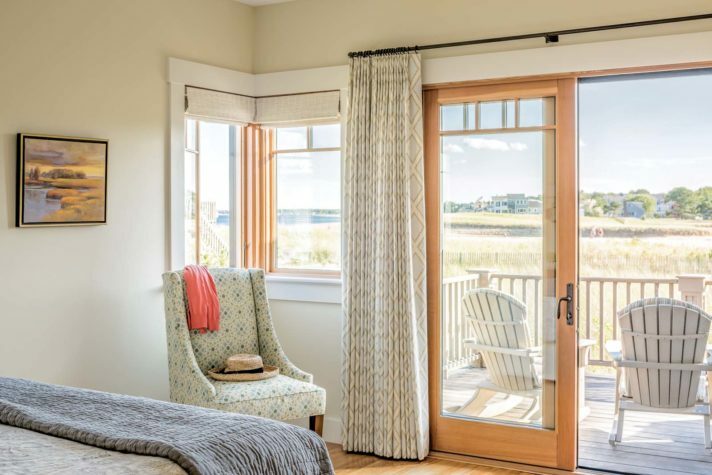 Designer Annie Stickney, formerly of Simply Home/ Banks Design Associates and now of Annie Stickney Design, brought in the rusty tangerines and oranges of the sunrises and sunsets visible through the wall of windows. The painting of sandpipers is by Trip Park. Kevin and Kathy Smith’s new home, which sits on three dozen piles, is located directly behind their rst one. The curved roof is clad in copper. The landscaping is by Bourne Landscape. 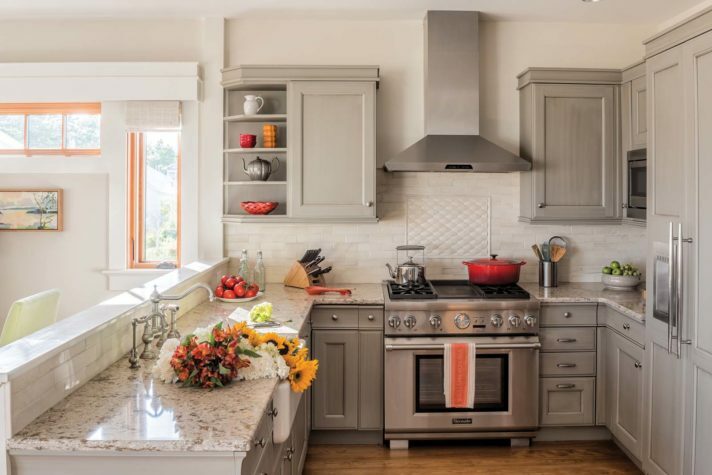 Factory-made kitchen cabinets were elevated with custom cove moulding. 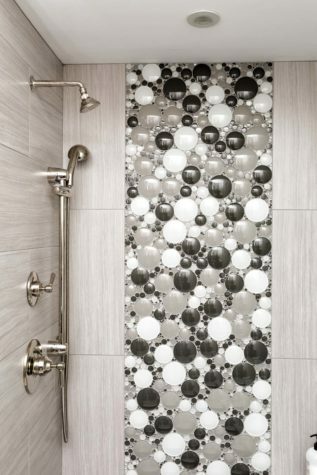 An upstairs shower features black, gray, and white bubble tile, which was selected by the Smiths’ daughter. 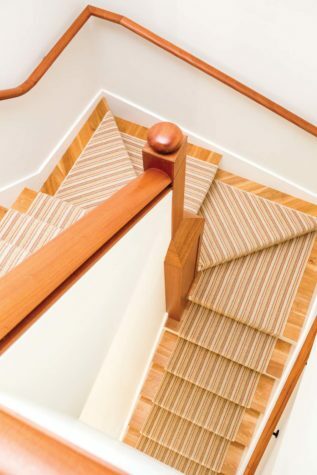 The handrail was made by Tim Hill Fine Woodworking and assembled and sanded on-site by Rideout and Turner. 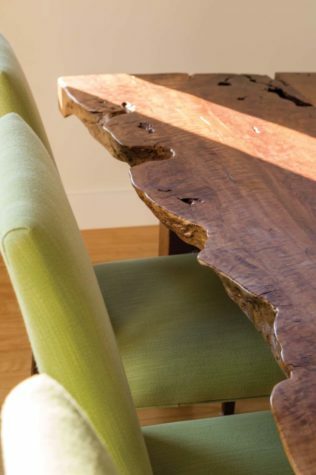 The custom live- edge dining table weighs 760 pounds. The second-story covered porch is a favorite hang-out spot and occasional sleeping nook for the Smiths’ four grown children. 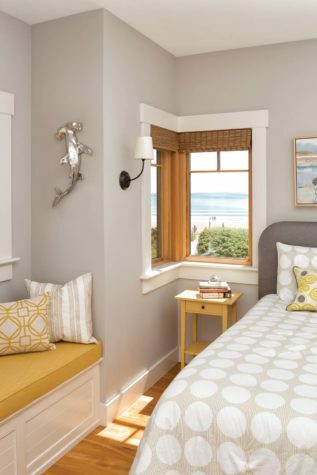 An upstairs bedroom features a gray color scheme selected by one of the Smiths’ sons, which Stickney accented with school bus yellow. 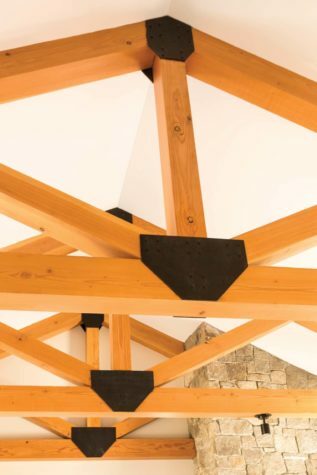 ay Turner of Rideout and Turner cut and laid out the structural Douglas r trusses, now over the upstairs common area, on the oor piece by piece, and then mounted them together. 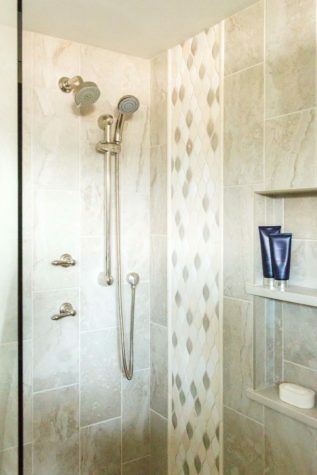 The owners’ bath has a shower niche with two shelves. A deck o the owners’ suite overlooks Goosefare Brook. The artwork is by Holly Ready. In the second- oor common area (left), a sofa from Simply Home is wide enough to double as a bed. Above it hangs Carrie Lonsdale’s J 24 Race Night, also from Simply Home. 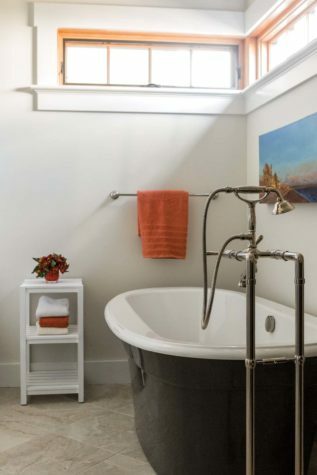 A painting by Ann Glover hangs above a freestanding tub in the owners’ bathroom. Ever since Kevin and Kathy Smith began dating when they were 16, the couple—who have now been married for 36 years—have visited Ocean Park in Old Orchard Beach. Each summer, the Smiths have continued to make the trip from Canada, their life unfolding over time: they visited when Kevin was in medical school, then as they raised their four children, and now as grandparents to a baby boy, with two more grandchildren on the way. The Smiths were drawn to the beach, of course, but also all that Ocean Park had to offer: ice cream shops, restaurants, tennis courts, shuffleboard, and a church that their family could attend on Sundays. The Smiths rented in the area when their kids were young (something Kevin’s own parents had done), and then, in 2008, the Smiths bought and renovated an oceanfront home. “We had no qualms about it because our four kids, even as teenagers, never gave us any grief about going on vacation,” says Kevin. 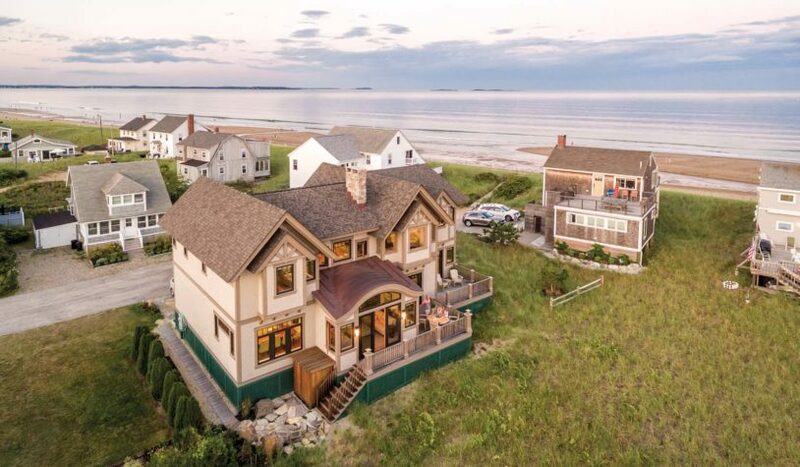 “They always wanted to go to the beach.” The home soon became the gathering spot both for extended family, after Kevin’s two sisters moved to New England, and for their kids’ friends—at one point, the Smiths even hosted the Bridgton Academy hockey team, on which one of their sons played. So in 2012, when a property adjacent to their home and set back from the ocean overlooking Goosefare Brook became available, they seized the opportunity to design for how their life had become, as well as for the future: with four grown children, grandchildren, and retirement on the horizon. 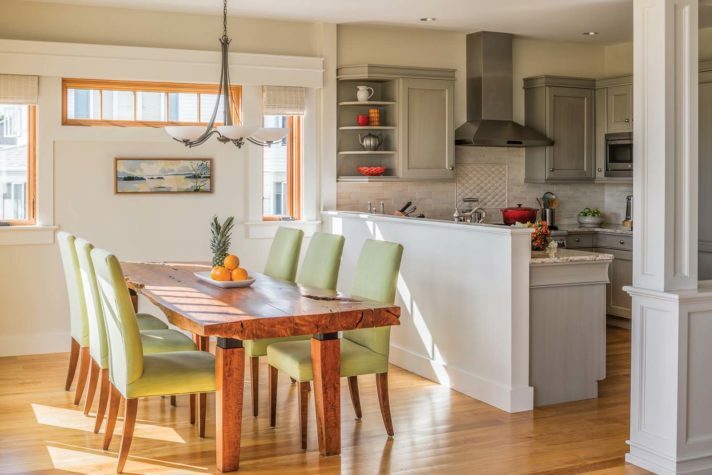 The couple knew they’d hire Rideout and Turner of Gray, the builder they had worked with on their first Ocean Park home. 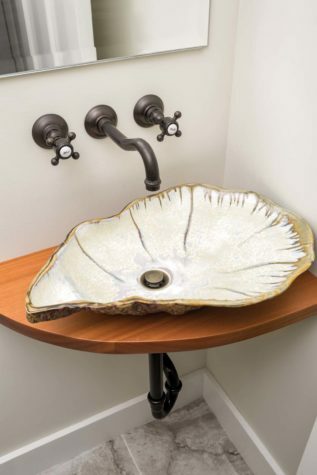 “They truly care about their workmanship,” says Kathy. 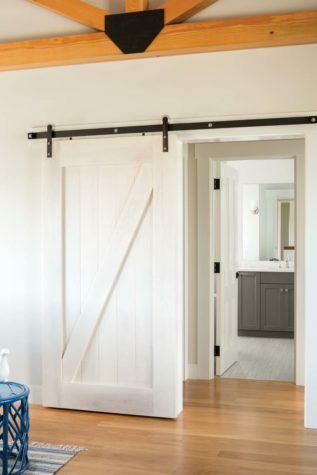 “I can call them up anytime with anything and they’re right there.” The Smiths also reached out to architect John D. Morris II, principal of John Morris Architects, to design the home. “The main goals were to provide them the amount of space that they needed, given this sort of extended family, with the kids and grandkids and friends, on a very limited piece of land, and with a modest budget,” he says. Morris accomplished this by designing a simply structured two-story floor plan composed of four boxes lined up next to each other. On the first floor are the living, dining, and kitchen areas, a powder room, and, tucked off toward the ocean, an owners’ suite with a study. Screened off behind an open fireplace in the living space is a small sitting area (Kathy refers to it as her “woman cave”), where she and her sisters-in-law will enjoy a glass of wine. 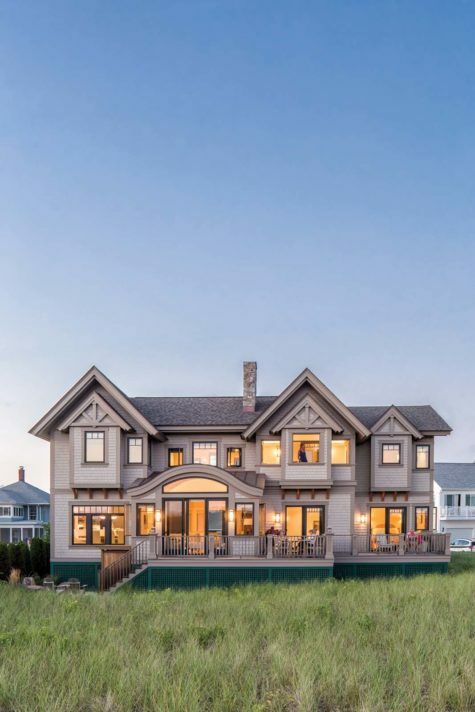 On the second floor are four corner bedrooms—one for each adult child— that all share a common, central living area outfitted with a bar and porch, as well as three bathrooms. 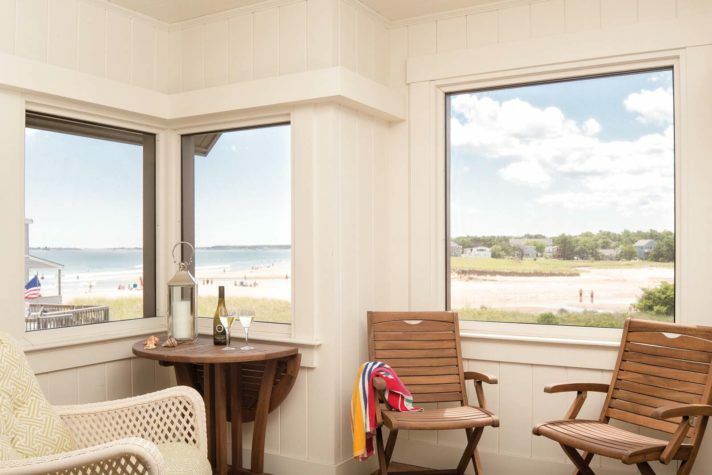 “As soon as you walk in the front door, you’re almost back outside again thanks to the giant wall of windows that John designed,” says Stickney. “It goes from zero to 60 in 20 feet. Bam. You’re here. There’s the ocean. There’s the inlet. There’s the beach. There’s the grass. The place buzzes with a sort of energy. You’re on vacation.” So as to not compete with the view, the designer took her color cues from the evolving marsh scenes right outside. “Kathy didn’t want red, white, and blue. It’s easy to pound the beach theme into the ground,” she says. “Instead, we did sea greens and gray blues and looked to pop it with colors that are in the sky: the oranges and tangerines from sunrises and sunsets. 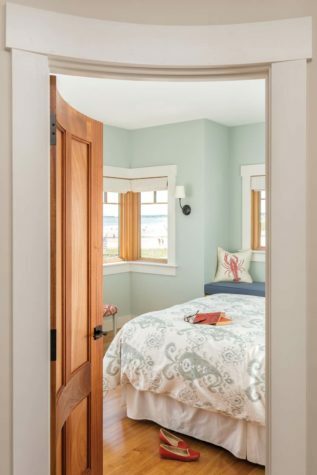 Those are the punctuation marks that make it fun.” Upstairs in the bedrooms, each child selected their room’s individual color palette, and then Stickney incorporated one shade from each bedroom in the shared living area. 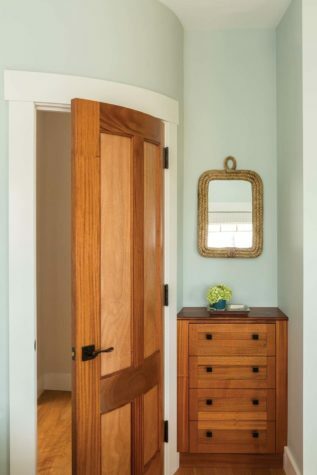 Additional pieces of the home’s jewelry include several elements designed by Morris and crafted by Tim Hill Fine Woodworking, such as the curved mahogany bedroom doors, mahogany built-in bureaus, and a lychee live-edge dining table. The latter was “meant to be,” Kathy says, explaining that they couldn’t find any tables they liked— Kevin found most of them too wide for intimate conversations—until they visited Hill’s shop. There they fell in love with the live-edge tabletop, originally intended for a corporate space, but they didn’t care for the ironwood bow ties that ran down its center. Hill offered to remove them, which happily resulted in the exact table width that the Smiths were after. The piece was finished with an iron base that Morris designed, and Kathy requested that the surface’s small gaps (including one from a lightning strike) remain unfilled. “I can just picture my grandchildren playing and putting their little toys down the holes,” she says. 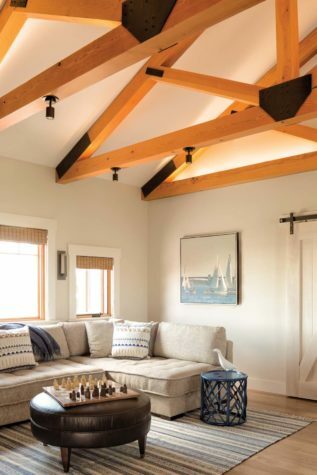 It’s that family-friendly attitude that gives the home its comfort and charm. 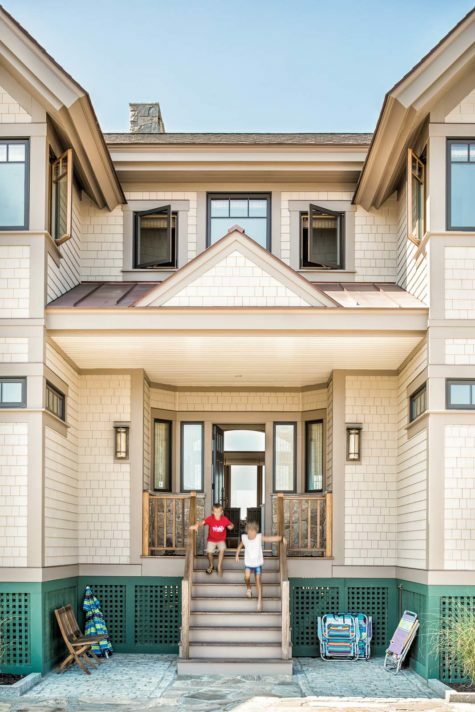 “It’s a house that’s not fussy, not frilly,” says Stickney. “They simply want it so that they can pack a lot of people in, to be able to put everybody around that dining table and not have anybody worry about spilling.” In that vein, Stickney made sure there were plenty of cozy places for lounging and gathering, such as in the living area, where an armless sofa lets guests easily slide in and out of a conversation, and in the upstairs common area, where a sectional sofa is wide enough to double as a bed for overnight guests. “I understood what they were trying to achieve, which is to make a place that’s magical for the generations to come,” she says. 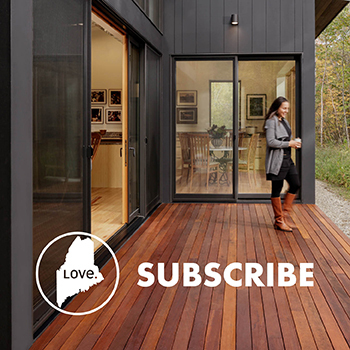 The home’s entrance ushers guests inside to take in the view from the living area. Most of the home’s windows face south to a ord views out over Goosefare Brook. The location is just a few sandy steps away from the beach, so the outdoor shower, which is behind the stairway, sees its fair share of use.